1. Slice your cauliflower into one inch steaks and roast in the oven (375F) on a greased pan for about 30 minutes. 2. In a bowl combine all other ingredients expect the feta. 3. When the cauliflower is nicely browned, delicately transfer it to your serving platter (at this point, they’re soft and do fall apart easily). 4. 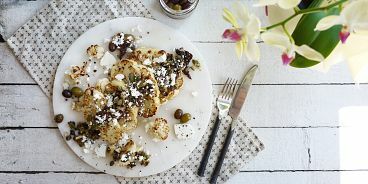 Spoon your salty mixture onto the cauliflower, then top with feta. Enjoy!